All Things X: Xstatic! Just 3 weeks left for the US release of Wolverine Anime in English! Xstatic! Just 3 weeks left for the US release of Wolverine Anime in English! Marvel will be bringing us 4 anime shows this year together with Japanese animation studio Madhouse based on 4 of their most popular characters: Iron Man, Wolverine, X-Men & Blade. AND the Iron Man & Wolverine Anime toons will be releasing in English on G4 in the US from July 29! Just 3 weeks away! The English X-Men & Blade anime episodes will be airing later this year. ^The mutants are back to storm your TV & computer screens this year! The last dedicated X-Men cartoon that we witnessed on our telly screens (or computers as in my case :P ) was back in 2008! Yes, I'm talking about that seriously AWESOME cartoon, Wolverine and the X-Men, that used to be aired on Nicktoons in the US. It continued for a good 26 episodes from 2008-09 in it's first & sadly, only season (so far!). In fact concept art & ideas for Season 2 can be found on the 1 Million to save WOLVERINE AND THE X-MEN FB group (do join that cause if you wish to see this amazing show back again) but all plans were stalled due to unresolved issues between Marvel Animation & their financial partners. But the show is popular still & Nicktoons even decided to air a 10 hour marathon of the show last Monday (the 4th of July) in the US! It was basically about Wolverine having to lead the X-Men after Professor X's mysterious disappearance. Check out the trailer for the show, if you (still??) haven't seen the show yet! Hitler saw it- & even HE was pissed off it got cancelled! LMAO! Anywho, onto the topic at hand! 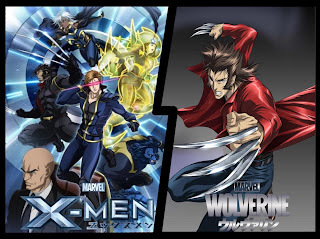 Iron Man & Wolverine have already both aired in Japan on Animax, but let's talk about the Wolverine & X-Men anime toons. The first season of Marvel Anime: Wolverine has 12 action-packed episodes. The Wolverine you'll see in this version is highly "Japan-ized" almost to the point of being unrecognizable (besides the claws, of course) irking scores of X-fans in the US. Here, Wolverine finds out that his girlfriend Mariko Yashida, has been kidnapped by her father Shingen (an AIM supplier who also happens to be a Tokyo crime lord). This takes him on his journey to Japan. Mariko, btw, is a character who does appear prominently in Wolverine's Japanese storyline in the comics. Who knows she may even make an appearance in The Wolverine...? It would be great to see that dynamic- Mariko & Logan being torn apart by the Lady Deathstrike & the Silver Samurai (Mariko's step brother & the MAIN thorn in Logan's side in Japan)! But there I go straying off track again lol! Just enjoy this trailer for Marvel Anime: Wolverine...It's for the Japanese version but doesn't have any dialogues so no sweat! Some of the popular X-characters who will be featured in MA: Wolverine include Cyclops & Omega Red. Cyclops on the other hand will be taking center stage in Marvel Anime: X-Men! Also comprising of 12 episodes, Season 1 will have Cyke & all our other favorites: Wolverine, Jean Grey /Phoenix, Storm, Emma Frost, Beast & of course, Professor X, amongst others. Watch this space for updates on when the X-Men Anime show will air in English in the US. Until then the countdown begins for Wolverine (& of course, Iron Man)!